Music Review Analysis of Himesh Reshammiya's album Kick (2014). The song begins with grand peppy instrumental USP theme piece. The wicked funky semi plugged beat builds up the song intro from 0.06 to 0.13 and it is tremendous build up until this point. Mast tapori styled foot tapping rhythmic beats kick in from 0.13 onwards aget get the listener swaying. The composition pattern has quick compositional notes. Salman's vocals sound raw n rugged at certain portions. Salman's mukhda lines followed by intermittent peppy instrumental USP theme piece from 0.27 to 0.37 builds up the song. Off-da-hook quick repetitive wicked Techno tune followed by off-da-hook quick drum hits in unplugged mode from 0.41 to 0.45 & 0.55 to 0.59 give terrific intermittent effect. The grand peppy instrumental USP theme piece along with underlying mast tapori beats from 1.13 to 1.19, 1.33 to 1.39 give completeness effect to Salman's mukhda lines. Salman's quick lines from 1.06 to 1.12 are effective, with emphasis on TABAH (off-da-hook casual bindaas vocals, whereby he rwaks it) at 1.12 along with off-da-hook quick heavy drum hit pattern from 1.10 to 1.12 that gives kick. Salman's lines from 1.26 to 1.28 sung with enthausiastic emphasis vocals makes the listener smile. Salman's line, HAI TERE PYAAR SE (off-da-hook naarebaazi slogan based singing, whereby he rwaks it) from 1.32 to 1.33 along with hard drum hits in sync that gets the listener into da zone n feel it. His lines from 2.22 to 2.35 have the best composition pattern in the mukhda, and the intermittent HAAH chants give kick. Palak's line, HAAAAAAI (naughty jovial gradual voice rise) from 3.23 to 3.25 as if the heroine is responding to the hero's eariler antics. Her feel good vocals in lower pitch range from 3.25 to 3.38 keep the peppy mood going. Her high pitched lines from 3.39 to 3.52 have the best composition pattern in the mukhda. 1. Salman Khan's casual bindaas energetic arrogant feel vocals. 2. Palak Mucchal's feel good vocals. 3. Underlying mast tapori foot tapping rhythmic beats. 4. Grand peppy instrumental USP theme piece, off-da-hook quick repetitive wicked Techno tune followed by off-da-hook quick drum hits and Arabian tune in between 1st stanza gap. Though one would say that Mika Singh is apt for such a song, but Salman Khan's vocals suit better to this song and make it more effective and catchy. The song sounds just about decent in Mika's vocals, but Salman's version takes it to another level. The pagalpan n madness involved to sing this song is equipped with Salman's vocals. In fact, Mika Singh sounded way better n Rwaked it in his recent previous song for Himesh i.e. Khol De Dil Ki Khidki from Humshakals. Mika sings in his usual trademark style with bindaas happy go lucky feel good vocals. N.B = Since the orchsetration of both versions is the same, please refer to Salman version for the review about the full orchestration. The song begins with likeable piano keys until 0.22 followed by warm strings until 0.33 in unplugged mode. Mesmerizing feel good guitar riffs with off-da-hook catchy riff pattern (with catchy upward twist at the end of the riff at 0.36, 0.38 and so on) join in from 0.34 onwards and play in a constant repetitive loop. They are a musical treat n delight to hear. Neeti Mohan sings the opening mukhda lines from 0.40 to 1.01 & 1.22 to 1.43 with subtle feel vocals. Neeti's lines, WOOOW * 4 (awesome lullaby croons) from 1.13 to 1.21 & 1.55 to 2.04 give completeness effect to her preceeding mukhda lines. Awesome lyrics, ITNA TOH BATA MAUSAMO KI TARAH TU BADALTA GAYA KYUN HAI. It is better than the 1st stanza. 1. Neeti Mohan's combo of subtle feel vocals and wholehearted high pitched vocals. 3. Mesmerizing feel good guitar riffs with off-da-hook catchy riff pattern, warm strings, likeable piano keys. The 'mode n style' in which Irfan sings this song is way better than what his 'mode n style' was in Dard Dilon Ke, as he sounds original wich his true identity. The scale of this song is lower than the female version. Mesmerizing feel good guitar riffs with off-da-hook catchy riff pattern (with catchy upward twist at the end of the riff at 0.36, 0.38 and so on) are catchier than the higher pitched riffs in female version. Irfan's mukhda lines, TU HI TU HAR JAGAH AAJ KAL KYUN HAI (terrific composition pattern) from 0.40 to 0.50 from 1.22 to 1.33 are the best mukhda lines. The way he sings these lines and coupled with underlying laidback beat gives it a 'Sharaiyana' touch. Irfan's high pitched lines from 1.02 to 1.10 & 1.44 to 1.52 have Kashish in them. Irfan's lines, WOOOW * 4 (awesome subtle feel croons) from 1.13 to 1.21 & 1.55 to 2.04 give completeness effect to preceeding mukhda lines. 1. Mohd Irfan's vocals with Kashish. 2. Mesmerizing feel good guitar riffs with off-da-hook catchy riff pattern (with catchy upward twist at the end of the riff) at lower scale. Ofcourse, without doubt the Mohd Irfan's version is the ideal preferred choice from singing quality point of view but it shoudn't be any surprise because its a case of a pro singer vs an actor who is trying his attempt at singing (and also who definitely throws a pleasant surprise in doing so, as compared to how he sounded over the years singing a few lines here and there in reality shows or social interviews). Though Salman's vocals sound raw n rugged at certain portions, he does an able competent job with his own style and overall the song is appealing, pleasant n likeable hear. Salman fans are going to love his singing efforts in this song and also his version of the song, especially even more so upon repeat hears. In fact despite the singing shortcomings whatsoever, the use of Autotune gives this song an interesting flavor and its own unique touch n twist. The way Salman croons WOOOW with innocence from 1.13 to 1.21 & 1.55 to 2.04 makes the listener smile. This version could be heard while eating cuisine in a great restaurant along with ambiance of dimmed lights and artificial waterfall on the wall sides, and it takes the listener there to that imaginary place in the thoughts that they actually want to go there and experience the feeling. The song begins with quick likeable piano keys along with intermittent female seductive feel croon. The quick repetitive hits and rising siren sound from 0.12 to 0.18 build up the intro. The heavy clap effect in the underlying beat remind those of ISHQ NE TERE REMIX from AHISTA AHISTA. The remix builds up from with semi plugged beats from 0.38 to 0.47 with catchy feel good guitar riffs along with semi plugged clap effect. The remix is in full form and rolls on from 0.47 onwards with full on underlying rhythmic beats. The build up is great with unplugged mode n bazz sound from 3.10 to 3.14 followed by semi plugged thump effect and clap effect along with catchy feel good guitar riffs from 3.15 to 3.19, followed by full on underlying beats from 3.19 onwards whereby the remix rolls on. Good use has been made in terms of switching in between 'semi plugged' and 'full on' mode, to give that kick. N.B = Since the orchsetration of male n female remix is the same, please refer to Female remix for the review about the full orchestration. The male remix is at a lower scale than the female remix. Catchy upbeat vibrant Electro tune from 0.28 to 0.37, 1.06 to 1.13 & 1.23 to 1.32 and so on throughout the song, whereby the remix becomes Rwakin and makes the listener feel it. Off-da-hook beat effect followed by off-da-hook raw fast drum-roll hits from 0.35 to 0.38, 1.03 to 1.06 and so on. Feel good male rap with attitude, coolness, casualness n style that makes the listener smile. Sounds like a Desi Dhol Mix which would find airtime ay festivals and social gatherings. The dhol pattern loop is in 'Ae Ganpat Chal Baja Na' mode. The build up with semi plugged beats from 2.40 to 2.44 followed by quick heavy drum hits from 2.45 to 2.46 is nice. It is a decent singing attempt by Salman. In the first hearing, the listener gets an initial impression of Salmans singing shortcomings in some song portions, but later on gets used to them after repeat hears. His voice sounds raw n rugged at certain portions which is pretty much acceptable considering that this song is among his first playback outings. Also, Salman has sung Hangover better than Tu Hi Tu and Jumme Ki Raat. He has sung Jumme Ki Raat better than Tu Hi Tu (as far as pitch correction is concerned i.e. there is more pitch correction in Tu Hi Tu whereas he has managed Jumme Ki Raat fairly well without much of its use). It is of the opinion that Salman could have sung both Jumme Ki Raat n Tu Hi Tu even better than what he has. This could not be due to the fact that Tu Hi Tu was more difficult to sing and Jumme Ki Raat required lots of energy n vigor without breaks in between portions. Also, due to the fact that it was a hurried Ad Hoc instant decision for Salman to croon the 2 two Himesh tracks, after seeing the response to Hangover. Anyways, it was a good decision as it would not be a great thing for Himesh fans point of view, if Salman made his singing debut for another composer in an album in which his 'mentor' was also a composer. Furthermore, since there are already the original versions of both Himesh songs, their Salman versions are an added bonus and only further showcase Salman's singing prowress and credentials. It is a classy composition by Himesh that grows upon the listener upon repeat hear. The song is representative of lovers having a casual walk in the park and confessing their love. Both versions are equal and good in their own ways. Neeti's version is slightly better as it gives more chain aur sukoon. Neeti's version has an 'Eternal bond' due to the way she sings. Mohd Irfan's opening mukhda lines TU HI TU HAR JAGAH AAJ KAL KYUN HAI are catchier than Neeti's same lines, but Neeti's other remaining lines are more effective than Irfan's other remaining lines in their respective versions. Neeti sings with a combo of heartfelt subtle feel vocals in lower pitch and wholehearted croons in high pitch, whereas Mohd Irfan has a Sharyaana approach in lower pitch with kashish in higher pitched vocals. The mesmerizing feel good guitar riffs with off-da-hook catchy riff pattern (with catchy upward twist at the end of the riff) are more catchier in male version as compared to the female version. It is a total masti dhamaal song and fun filled blast of a party celebration song. Peppy theme piece used intermittently throught is the instrumental USP. 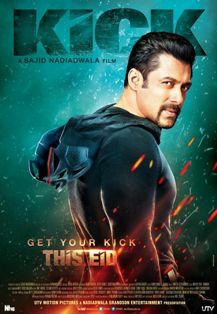 Mast tapori styled rhythmic beats kick in from 0.13 onwards get the listener swaying. Off-da-hook quick repetitive wicked Techno tune followed by off-da-hook quick drum hits in unplugged mode from 0.41 to 0.45 & 0.55 to 0.59 give terrific intermittent effect. Such songs are working really well in today's times n also suit Salman's persona n for his on screen antics. This the most successful n flagship song of Kick, so it served its purpose. There are reports that whistles have been blown in theatres when this song appears. Singingwise, its quite a challenging composition [especially the mukhda] reason being, that it has high pitched quick notes n has to be sung with zeal n vigor. So there are 3 aspects for a singer to achieve at the same time...quick singing, at high pitch, n with intensity...its easy to compromise any one of them. Himesh's take on Jumme Ki Raat: he says that its made on 6/8 beat rhythm n that recently few songs have been made on this pattern, but this song needed some western sensibilities but with a desi flavor, n so it is a first time fusion attempt by keeping in mind the songs of Pancham Da n Laxmikant Pyarelal. He says that the song is crux [thori 'tedhi' composition hai], with crossovers n double crossovers, n with all 3 pitch ranges...but the hook line is simple...n he shares an emotional bond with Salman n success of this song is an emotional moment, n Salman has taken it to another level, Jacqline looks pretty, Sajid has shot it very well n Ahmed Khan has choreographed it well. Ofcourse, without doubt the Mohd Irfan's version is the ideal preferred choice from singing quality point of view but it shoudn't be any surprise because its a case of a pro singer vs an actor who is trying his attempt at singing (and also who definitely throws a pleasant surprise in doing so, as compared to how he sounded over the years singing a few lines here and there in reality shows or social interviews). The way Salman croons WOOOW with innocence from 1.13 to 1.21 & 1.55 to 2.04 makes the listener smile. Salman has a Sharp tonal quality in his voice which strikes a chord at certain portions which have his best lines i.e. HAR DAFA from 0.51 to 0.53 & 1.34 to 1.35, MUJHSE PUCHE BHALA from 0.56 to 0.59 & 1.38 to 1.40, BEKARAARI KYUN HAI, YEH KHUMAARI KYUN HAI, AAWARGI KYUN HAI, HAR MOD PAR (though Autotune is used, but overall its still likeable) from 2.26 to 2.37, HAR AARZOO HU HI, CHAIN-O-SUKOON TU HI, MAI TOH KAHUN TU HI HAI ZINDAGI (though Autotune is used, but overall its still likeable) from 4.05 to 4.16, Though Salman's vocals sound raw n rugged at certain portions, he does an able competent job with his own style and overall the song is appealing, pleasant n likeable hear. Salman fans are going to love his singing efforts in this song and also his version of the song, especially even more so upon repeat hears. In fact despite the singing shortcomings whatsoever, the use of Autotune gives this song an interesting flavor and its own unique touch n twist. N.B. = Tu Hi Tu - Salman version is ranked at 3 only due to the overall audio quality as far as Radio / public airplay is concerned, as it sounds patchy at places and slightly below the usual pro level, due to the fact that listeners can quite evidently make out that Autotune is used generously at places, whereas Jumme Ki Raat - Mika version is pro as far as Radio / public airplay is concerned (n how a usual benchmark Himesh song should be). Otherwise, if the shortcomings in Tu Hi Tu - Salman version are overlooked, Tu Hi Tu - Salman would be ranked 2 [TIE] with Jumme Ki Raat - Mika version. While the template of Jumme Ki Raat is similar to Himesh's earlier such songs which have peppy theme piece, mast tapori styled foot tapping beats and quick compositional pattern, Himesh shows yet another new facet of compositional style that is out of his trademark zone. Tu Hi Tu has a free flowing compositional pattern whereby Himesh shows yet another new facet of compositional style that is out of his trademark zone. > Mukhda lines, TU HI TU HAR JAGAH AAJ KAL KYUN HAI (terrific composition pattern) from 0.40 to 0.50 & 1.22 to 1.33 in Tu Hi Tu - Irfan version. > Mukhda lines with quick compositional pattern from 1.06 to 1.12, HAI TERE PYAAR SE (slogan based composition pattern) from 1.32 to 1.33, Stanza lines from 2.22 to 2.35 & 3.39 to 3.52 in Jumme Ki Raat - Salman version. > Grand peppy tune is the instrumental theme piece and apt for a massy song like Jumme Ki Raat. > Mesmerizing guitar riffs that are the instrumental USP and musical treat n delight in Tu Hi Tu. > Off-da-hook quick repetitive wicked Techno tune followed by off-da-hook quick drum hits in unplugged mode from 0.41 to 0.45 & 0.55 to 0.59 in Jumme Ki Raat. > Off-da-hook quick heavy drum hit pattern that gives kick from 1.10 to 1.12 and hard drum hits that give kick from 1.31 to 1.32 in Jumme Ki Raat. > Mast tapori styled foot tapping beats that get the listener swaying in Jumme Ki Raat. > Warm strings piece from 3.32 to 3.42 in Tu Hi Tu. > Mohd Irfan and Neeti Mohan are the apt choices for male and female versions of Tu Hi Tu. > Jumme Ki Raat is apt n more suited for Salman's vocals. Best lyric line is ITNA TOH BATA MAUSAMO KI TARAH TU BADALTA GAYA KYUN HAI in Tu Hi Tu - Neeti version. Himesh gives one classy song (which would make for a great onscreen romance outing that has long lasting recall value) and one massy song (that works perfectly when picturized onscreen on Salman 'Bhai' as his fans call him, which has that required commercial appeal to generate buzz for further bolstering the initial box office opening n which is an apt song to give the required 'audio kick' for a film of such magnitude n genre). So as far as Himesh as a co-composer is concerned in this album, he has both ends covered. This 'mass-class' dual combo gives him scope as a composer, rather than having both songs in same genre n zone. Ther originals are backed up by their remix counterparts, which will find airtime in clubs (Tu Hi Tu - Remix) and in festivals n social gatherings (Jumme Ki Raat - Remix). Also, Salman singing in Himesh songs can only be a sweet feeling for the fans of both, and also as far as their personal n professional bond goes.